A first person view racing drone is some of the most fun you will ever have while standing safely with two feet on the ground. FPV drones offer excitement and competition with groundbreaking technology. That’s why we went out to find the best FPV racing drones for sale. We researched a variety of new and best selling products – the result is the top ten FPV drone reviews below. Now: Before we get started, here’s what you need to know when shopping. 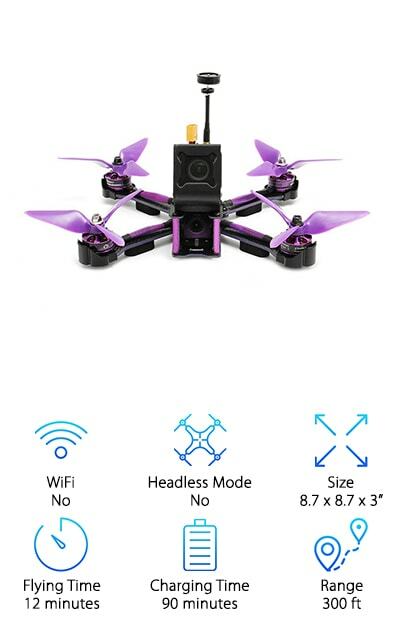 WiFi: Some, not all, of our racing drones offer connections using WiFi. This can be an advantage for both the avid user and the casual beginner. It aids in communicating clear video from the air down to the ground. 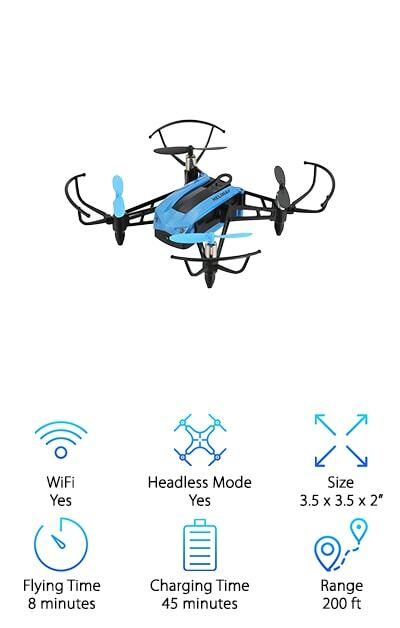 Headless Mode: You do not have to worry about the orientation of your drone anymore if it includes headless mode. This is a wonderful asset for the drone newbie. Position it facing the same direction, then direct it to go right or left. Size: While the size of a drone does not generally reflect on flying time, it’s still an important factor. Kids and teens might have an easier time handling something on the smaller side. 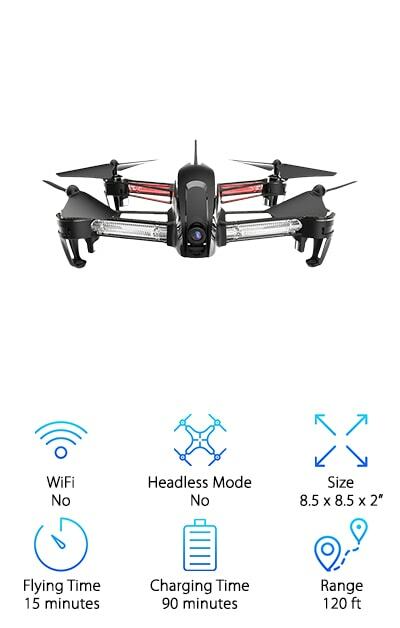 Size is indicated in inches for all drones! Flying Time: Flying time refers to the total amount of minutes a drone can be up in the air before it has to be charged up again. There is great variation with flying time amongst drones, especially when the range is factored in. Charging Time: Charging time refers to the amount of time it takes to fully restore battery power to any one of our drones. In many cases, drones come with more than one battery or extras can be purchased. Take that into account! Range: This is one of the most important considerations for anyone looking to purchase a drone. Depending on what you'd like to use it for, knowledge of the range is crucial. Once you’ve got the range in feet, you can plan flights! Now that you know how to choose the best FPV racing drones, let’s get right to the reviews. Here’s the deal: If you’re in a hurry, take a look at the top pick and the budget pick. Both are fantastic products and are among the very best drones we found. Right below, you’ll find all runner-ups in our racing drone reviews. If you’re looking for the best FPV drones, they are on this list. Let’s get started! People young and old get a real thrill out of piloting a first-person view racing drone. Racing drones are cool, they’re fun, and they do tricks! The Physport FPV Drone has a whole bag of tricks ready to go for you. 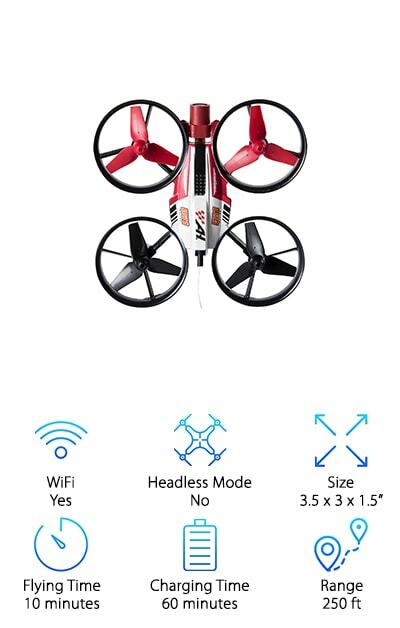 This foldable quadcopter measures 7 by 2 by 6.5 inches. It transmits a first-person view from the sky using WiFi, down to your virtual reality headset or a VR setup using your smartphone. All iOS and Android systems and phones are supported. There’s more: It can hover in place or move along as it shoots high-definition video and still images. 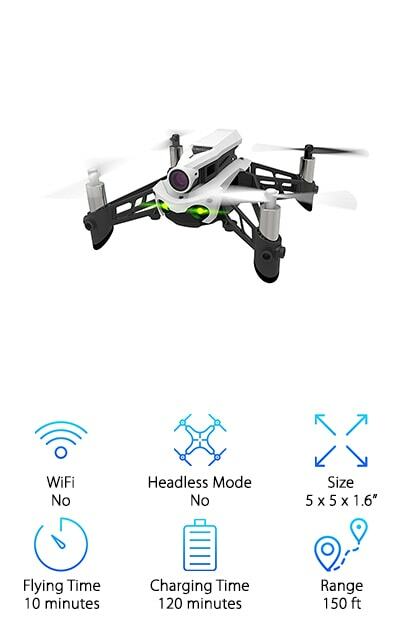 Headless mode helps you to understand drone movement, even when it is a maximum of 450 feet away. If you lose sight of your little flying buddy, hit the return button to bring it back home. Flying time totals out at about 9 minutes, and charging only takes an hour and a half. You’re going to love this drone! The best indoor FPV quadcopter for your money is the Air Hogs FPV Race Drone. Why? It doesn't take up a lot of room, but this small drone packs in a whole lot of fun. It is recommended for kids ages 8 and up. It is designed for both indoor and outdoor use. It's got a communication range of 250 feet, and it comes with a battery-powered controller with 4 channels. The only other thing you need for flying is a charge and a WiFi connection. Charging each battery for the Air Hogs drone takes only an hour, and then you get ten minutes of flying time. When it’s time to race, use the controller and the provided smartphone headset. You can do so much more than just race on the spot – use the free Air Hogs app to record and edit your race videos! Then, you can share them with other drone enthusiasts. May the best pilot win! Drones are awesome for teenagers and adults who are interested in electronics and engineering. The REDPAWZ Micro FPV Racing Drone introduces a new world of math and science to anyone who wants to do a little racing. 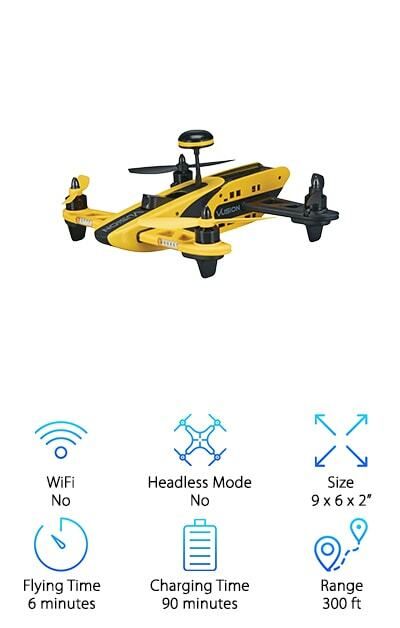 This drone is small and tough, measuring 3 by 3 by 1.7 inches. You can take it indoors or outdoors, traveling within a range of about 120 feet. Our racing drone buying guide would not be complete without a drone that can do a 360-degree barrel roll! That’s not the only trick up this drone’s sleeve. It can also do flips, and you can operate it in headless mode. You don’t just get the drone and the controller with purchase. You also get virtual reality goggles. It fits onto your face comfortably, with a sponge pad adjusting to your features. There are ventilation holes, and the headgear is adjustable. Charge up the battery in 45 minutes, and enjoy 6 minutes of flying time! Drone competitions are winner-take-all, so you need a racer that will get the job done. The best FPV quadcopter needs to be quick and easy to maneuver. That’s why we like the RISE Vusion Drone Race Pack. This drone can go 40 to 50 miles an hour if you push it! That is seriously fast. Bottom line: It could not be simpler to use or to fly. This race pack comes ready to go. No assembly or soldering is necessary. Use the 5.8GHz transmitter to watch every flight in real time. The 600TVL camera captures the action. Save your footage to the camera, or move it to a memory card using the included slot. FPV goggles put you right into the thick of things for every race. Charging time is 90 minutes, and flying time is 6 minutes. You can move the drone around within a limit of about 100 yards or 300 feet. It’s time to go big! Ready to fly – that is how the ARRIS X-Speed Racing Drone arrives at your doorstep. They assemble, tune, and test it. It has a camera mount on the front for a GoPro or something similar, or you can utilize the camera that is provided. FPV racing drones for sale are notorious for having cameras that don’t work particularly well, but that is not the case here. You get a Sony 700 line camera with first-person view capabilities. Grab your favorite monitor or goggles, and get ready for a clear picture in real time. The battery will charge up in about an hour and a half, and then you get up to 15 minutes of racing time. For a drone of this size, that is an extremely generous allotment of time! The range is approximately 300 feet, and you can drive the drone normally using the provided controller, or switch to acrobatic mode. Pull off rolls and dips and have a blast. The first indication you get that the Bolt Drone is a worthwhile purchase comes from the manufacturing process. The Bolt Drone FPV Racing Drone has a carbon fiber frame. This is the same material they use on supercars to keep the vehicles ultralight and fast. You get the same results from this drone! 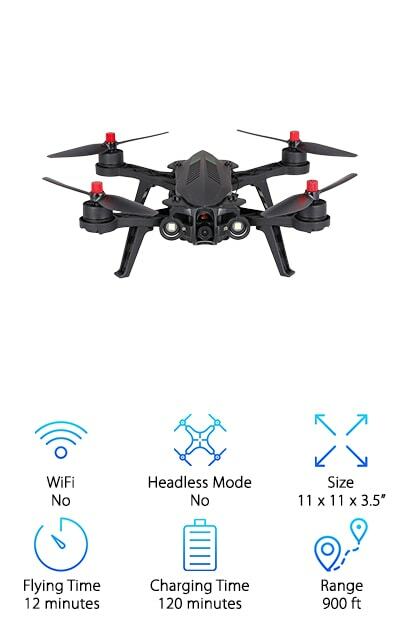 It stands out amongst DRL drones for sale for other reasons, too. The economic price is definitely a highlight. So is the HD camera that syncs up with your screen, and provides a live broadcast as you race. You get the goggles, the screen, the drone, the battery, and chargers for both the flying machine itself and the screen. Top speed of the Bolt Drone is 30 miles an hour. You will get about 15 minutes of flying time out of a single battery charge. The range is around 40 yards or 120 feet. You can use altitude hold to get some great shots. Enjoy your next flight! Not only does the Goolsky MJX Bugs Racing Drone arrive fully assembled, the battery is charged and it is ready to fly! There’s nothing more irritating than getting a package you’re excited to use, and then realizing there are 100 pieces to put together – right? 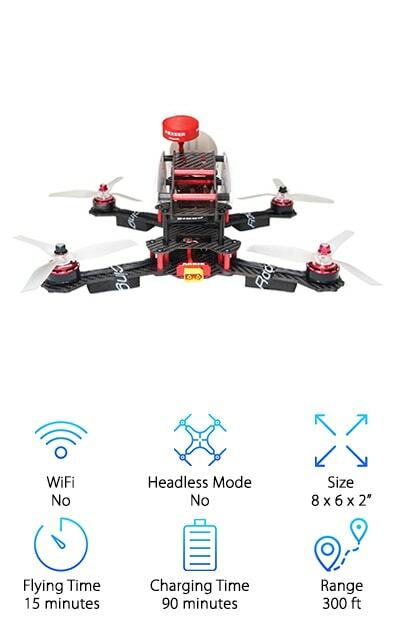 Racing drones for sale come in all shapes and sizes. The Goolsky Drone measures 11 by 11 by 3.5 inches. It has a fantastic range: About 900 feet. You’ve also got a solid camera on board for the first-person view flying experience. Night flying is an option, too, since the drone is equipped with LED lights. This is a durable little flyer. It comes with a lot of accessories, including the tool for replacing propellers, and an extra set. The remote controller is intuitive and fun to use, and the G3 goggles are immersive in any environment. You’ll get 12 minutes of flying time. Fly for fun, fly with friends, go win some races! You don’t need to purchase any additional parts or kits when you buy the Parrot Mambo FPV Racing Drone. This is built for pure racing fun, and you are going to have such a great time familiarizing yourself and becoming an expert with this machine. It is wonderful for beginners. It’s also good for the experts! The fly pad looks a lot like a gaming controller, and it is easy to use. The goggles are ready for the first-person view immersive experience. When you aren't flying, they can also be used as virtual reality goggles. Every battery for the Parrot Mambo charges up in an hour and a half and gives you 10 minutes of racing time. If you'd like, buy a couple of extra batteries and give yourself 30 minutes of exhilaration! The range of this drone is 150 feet, and it goes really fast – about 30 miles an hour. Those are the kinds of speeds that win races! All the bells and whistles are included on the FidgetKit FPV Mini Racing Drone. Even at its small size – 3.5 by 3.5 by 2 inches – you get the components you need to have an absolutely thrilling time. The FidgetKit drone goes up to 30 miles an hour. When it needs to move more slowly, change the settings off of high-speed mode. Use altitude hold to keep it in place, or headless mode to have it tilt the same way you are tilting your smartphone. It does flips in all 4 directions! Forward, backward, right, and left. 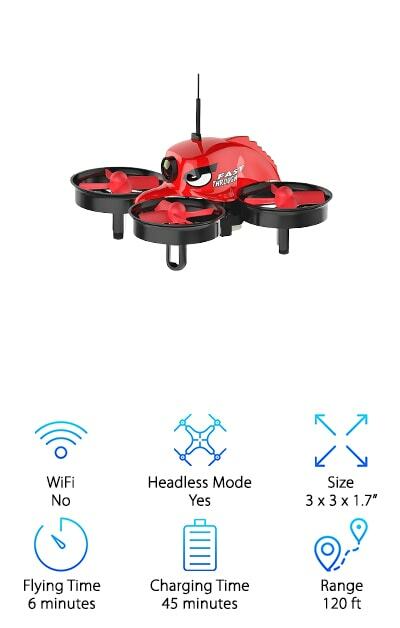 The remote control can operate on 4 different channels, so if you and your 3 best buds each score one of these drones, they can be flown and raced at the same time without interference. The range for the FidgetKit drone is 200 feet. It does operate using WiFi. Each battery will charge up in 45 minutes, for 8 minutes of flying time. What do you want to get from a racing drone? How about some speed! The EACHINE Wizard FPV Racer is not only a great little piece of engineering, it is also FAST. This DRL racing drone for sale will get you past the finish line with a medal every time. It measures 8.7 by 8.7 by 3 inches in dimension. The 700TVL camera can be adjusted so that you get the shot you need. Direction indicator LED lights will allow you to pilot even in low light. Parts are made from carbon fiber, so it will survive most crashes or drops. 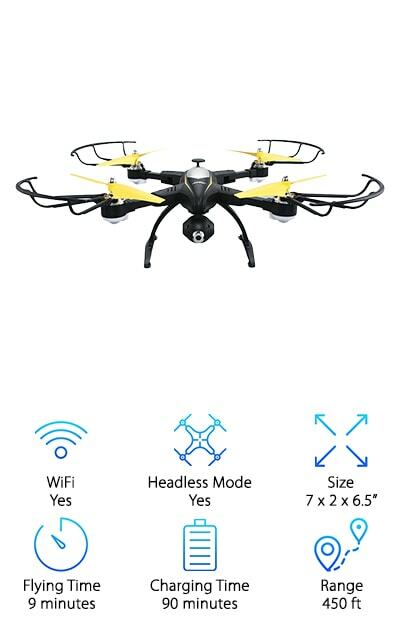 Your purchase includes the drone, the transmitter, the charger, a battery strap, antenna, and a wrench. There are also plenty of extra 3-blade purple propellers for flying. The drone has a charging time for batteries of about an hour and a half. Flying time is 12 minutes, plenty of time to get your racing on. The range is 300 feet!